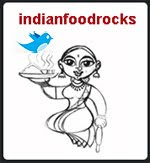 Indian Food Rocks: Nankatai, it is! Today is the 4th day of Diwali. Balipratipada. This is the day to seek the good in everyone, including those you don't particularly care for. I love the symbolism of Diwali. It's a warm fuzzy feeling! This Diwali has been extra special because I found that special recipe I was looking for all these years. The Nankatai recipe. There was much discourse between my husband and I, between my sister and my husband and finally my sister and I. I insisted that in Marathi, it is nankatai. They talked, burning international lines, efficiency of the conversation no longer in question, about how I had no clue and it was all the fault of that British convent school I studied in. My sister was at that school, too, but she suffered only two years of it while I was there much longer. It took its toll on me, they laughed, that I don't know the difference between ka and kha. I grabbed the phone and insisted that it is nankatai, only to be told that it has a lot of ghee in it, which might help oil the failing machinery. My mother came to my rescue. She has not one but two recipes for Nankatai, written in Marathi. If you're wondering why I went with nankhatai in my previous post, I didn't think of looking in my mother's diary for proof! Feel free to call them nankhatai, because that is what most of the rest of India does. But in my home, they are nankatai. 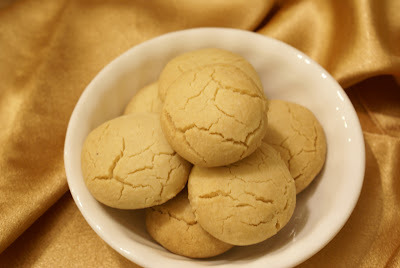 So here they are, golden powdery ghee-laden Indian cookies, nankatai. Warm the ghee in a kadhai till it is completely molten and is a lovely golden color. Make sure you do not warm it beyond this point. Add the powdered sugar and stir till it is completely dissolved. Add the flours and the powdered spices and stir well. Then knead the buttery dough with your hand (now you know why the ghee should not be too hot!) until it can all be brought together into a large ball. Then knead it some more for a few more minutes. Then shape into orbs that are about as big as a dollar coin and flatten slightly. The balls should not have any cracks at this point. If they do, you either need more dough in each ball or you are flattening them way too much. Place them on an ungreased cookie sheet at least 2 inches apart. Allow to cool for at least 5 minutes on the cookie sheet. If you try to yank them off immediately, you might lose some of that delicious bottom crust. Resist the urge to try them right away unless you want to hear your tongue sizzle. Believe me when I tell you that it hurts! And you can't taste anything anyway, so you might as well wait! Brew a cup of tea and either dunk these and enjoy them that way or just bite into the powdery delectable goodness and float away into that special place that is Mom. My Mom's recipe does not say anything about kneading the dough. This was based on the advice I got from gingerly after the first recipe failed. Feel free to experiment with the proportion of powdered spices. There were no measurements in my mother's recipe. So I played with the amounts till the dough tasted right. The next time though, I will add more dried ginger powder as I love the flavor it imparts. The nice thing about this dough is that you can taste it as you go along since it has no eggs. Um, don't tell anyone but I taste homemade batter that has eggs in it! I am sending this to Vee for the Jihva Special Editon : The Festive Series. Update: I am also sending this to Susan of Food Blogga for her Eat Christmas Cookies event. Nankatai is a holiday cookie, after all! Nankati or Nankhatai, I'll take what you say, I have never heard or tasted it before I came to foreign shores. Looks rich, delicious and oh-so-tempting! The Nankhatai looks delicious...will def try them..BTW WIsh you and you family a Happy Healthy and prosperous Diwali...I know its a bit late but its still heartfelt :)).. 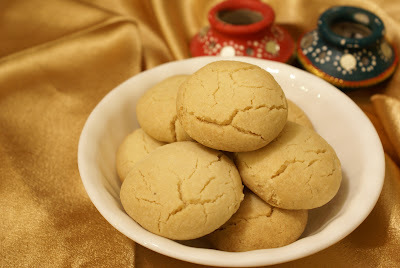 Your nankhatai, I mean nankatai, look absolutely fabulous - truly gorgeous! When you say 'knead' - there is no water involved, right? Just the good ol' buttery-ghee pulling it all together? Whats there in the name! Call them lil' treasures, if you want :-D. i am doing my own lil' dance on seeing the recipe :). This is the only time of the year that we consume so much ghee. I am already aghast that I had to buy another 1/2 kilo tin of Amul ghee. Usually, that lasts me a whole year! ISG, the whole house smelled wonderful! I must tell you though that Medha did not care for these. She does not like the powdery texture, yet she's crazy abotu besan ladu. Go figure! Nupur, they are! They are! Siri, the ingredients are similar substituting butter for ghee. But there's no vanilla essence in these and the final texture is a lot more dense than shortbread cookies. Ghee cannot be beaten like butter can. Rajitha, they are and simple to make, too! Molly, hugs to you and A. I've been meaning to call you! Happy Diwali to you, too! Shilpa, this recipe has besan, which I was told is similar to something the Persians make! I need to try that, too. But after at least another 6 months I think! No water. Knead does not mean water. Knead is the action more than what you use to to perform the action. So just ghee! The dough oozes ghee. These look so good Manisha. Thanks for a great recipe.. and best Diwali wishes. Finally, you got it right. I have been waiting 3 days for you to figure out the correct temperatures and the correct recipes. One more addition to my to do list! those look fabulous. i remember making them in school as part of some assignment, but there was a store i used to visit to buy them. i don't like cookies, but nakatais are realy special. will try them when we have visitors over. their little girl will enjoy them. i think i know why you call them 'nankatai'. it's a goan thing. like 'come for kana to my house, men.' lol. wow manisha, the nankatais look perfect ! I agree with Musical, what's in a name. They look gorgeous. Happy Diwali to you, too, Laavany! Vee, I can't wait to see the round-up! And whether you survive what I am sure is a staggering number of entries! Bee, jaada shanputti nahin karneka. Nahin to ek kaan ke niche lagayega, ha! Or I might just have to come over and putru some sense into dat tick skull of yours, men. Saju, if there was a contest in this post, you would have won it! Rahin, they're about as perfect as can be! try them! Cynthia, everything is in a name when it comes to nankatai! All other things, I agree wholeheartedly. But this here cookie? It's a nankatai! was away for couple of days and you posted many...have to catch up with all your post...good to know you are doing nawrt..whatever..its fun!...hope there is a dec one too around the corner...well I am not going to comment on the name..as I find it hard right now to get the correct tone!..but they look great! Yours look just right as in just like the ones I have had. Never made them though, bought them and loved them. I always thought it is "kh"
Wow...these are a lot like "butter cookies" or "shortbread cookies" of the western world- very similar proportion of fat:flour:sugar...of course the ghee, besan and spicing is uniquely Desi...(yeah...I know you know all of this already) Ok..I'm reading the other comments now...hmmm...denser eh? Butter has that little bit of water that changes things slightly, so these must be quite crispy and fall-apart-y! Quite intriguing. Quite waistline-expanding little devils aren't they? I want one!!! Have you ever added besan to chocolate-chip cookies? Looking forward to reading more yum posts on ur blog! These were the first things I tried when I first started baking and they came out without any fuss. Thanks for trying out various proportions so we can enjoy the perfect one! Thanks for the submission to Eat Christmas Cookies, Manisha! I'm so excited--I've never made a traditional Indian cookie before. They look lovely and must taste delicious. I came back to look at these again; yep, I agree with you on the use of ghee. I have absolutely no intention of baking with a man-made shortening, as I am sure these cookies have been around longer than that. Viva Ghee! Hi, I'm from the UK and have a question about the measurements. How much is 1.25 cup of ghee in grams? I just tried to make them and while they tast fantastic, were too soft and crumbly, I think I may have used the wrong measurement of ghee. cheeku, I will probably be making these again within the next 3 weeks, so I will make sure I measure it in weight - which is a more accurate measure anyway - and post it here. Did you try melting the ghee before you measured it? Was it homemade ghee you used? Homemade ghee has a lot more water content than does store-bought ghee. Manisha - I made them again and it seems that 100gms of store-bought ghee was just right for the recipe you provided. I weighed it before I melted it. I spoke to my mum this morning and she suggested I add sooji. Well, I did and I did not like them as much! I told her so! Your combination of white flour and a little besan is just perfect - they are totally melt in the mouth. Thank you so much for such a sublime recipe! cheeku, thanks for the feedback! I was planning to make nankatai as gifts for friends we were meeting while on vacation. But I got sucked into so much work that it was impossible to carve time to cook. I don't like the ones with sooji either! I find them a little too gritty. I like the nutty flavor that besan adds to these nankatai. I am so glad you liked them! yay! The recipe was perfect!!! Thanks. The only bit I wld want your readers to know is that the dough does not coem all tgtr after its been mixed. But thats fine because I cld make teh balls without them cracking. Also, for all the ppl worrying abt the amount of ghee, I found I cld make the recipe with two tbsp of less ghee too. The nankatais turned out perfect though. Thanks a lot.. I tried these out last night. At first I was confused whether to measure the solid or the molten ghee because when I made it according to the measurements it didn't all come together. So I added some more flour and besan till I could form a proper ball. After that it was smooth sailing. The nankatais turned out perfect! Thanks for the recipe Manisha! Oh I also added some ground pistachios and cashewnuts I has lying around and they added a really nice nutty flavor. Manisha,How much does your cup hold 250ml or 180 ml? Next time could you give measurements in grams for baking.It would be easy to recreate the recipe even for beginners.